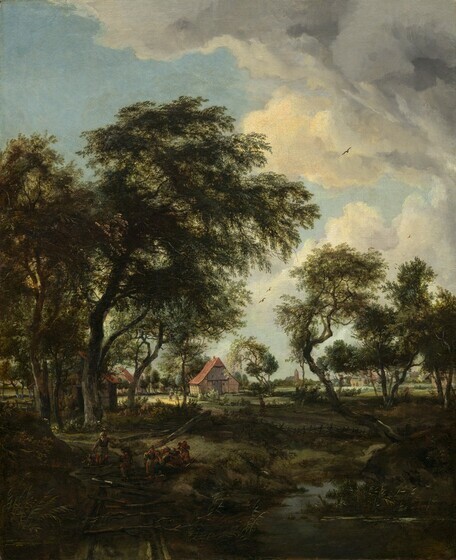 Arthur K. Wheelock Jr., “Meindert Hobbema/A Farm in the Sunlight/1668,” Dutch Paintings of the Seventeenth Century, NGA Online Editions, https://purl.org/nga/collection/artobject/67 (accessed April 19, 2019). 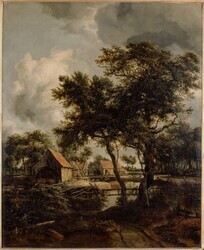 Meindert Hobbema studied under the noted landscape artist Jacob van Ruisdael, and quite a few of his compositions evolved from the work of his erstwhile master. Hobbema approached nature in a straightforward manner, depicting picturesque, rural scenery enlivened by the presence of peasants or hunters. He often reused favorite motifs such as old watermills, thatch-roofed cottages, and embanked dikes, rearranging them into new compositions. Hobbema’s rolling clouds allow patches of sunshine to illuminate the rutted roads or small streams that lead back into rustic woods. All six of the National Gallery’s canvases by Hobbema share these characteristics. The Farm in the Sunlight has long been esteemed as one of Hobbema’s finest paintings. It seems to have been one of a pair, its companion piece being The Mill, now in the Musée du Louvre, Paris, but the paintings were separated at a sale in 1833. In addition to compositional and stylistic similarities, both paintings have a vertical format—rare in Hobbema’s work—strengthening the argument that they were pendants. The watermill in the Louvre painting has been identified as the mill of a country estate in the province of Overijssel, and the half-timbered farmhouse with the high-peaked roof in the Farm in the Sunlight is representative of the architecture of the eastern provinces. This refined painting covers a preliminary sketch that Hobbema executed rapidly in rough paint strokes; he then painted the sky first, leaving reserves for the trees and the landscape. Inv. no. 2404. John Smith, A Catalogue Raisonné of the Works of the Most Eminent Dutch, Flemish and French Painters, 9 vols. (London, 1829–1842), 6:129, no. 53; Cornelis Hofstede de Groot, Beschreibendes und kritisches Verzeichnis der Werke der hervorragendsten holländischen Maler des XVII. Jahrhunderts, 10 vols. (Esslingen and Paris, 1907–1928), 4:401–402, no. 89; Georges Broulhiet, Meindert Hobbema (1638–1709) (Paris, 1938), 441. The dimensions of the Louvre painting (80 x 66 cm) are similar to those of A Farm in the Sunlight. The two works were separated at the Nieuwenhuys sale in 1833. Compare his pair of dune landscapes at the Fogg Art Museum, Harvard University, Cambridge, Massachusetts, reproduced in Wolfgan Stechow, Salomon van Ruysdael: eine Einführung in seine Kunst (Berlin, 1938), cats. 35, 36, figs. 48, 49. Jakob Rosenberg, “Hobbema,” Jahrbuch der Preussischen Kunstsammlungen 48, no. 3 (1927): 151. 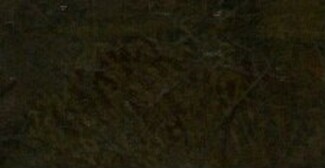 However, Rosenberg pushed the date too late, as became evident when remnants of the signature and date of 1668 were revealed during the conservation treatment of the painting in 1992. Although the trees in this work are somewhat elongated and the foliage is relatively transparent, stylistically they do not differ substantially from those in Hobbema’s A View on a High Road, signed and dated 1665. The most significant difference between these paintings is the increased complexity of the compositional structure of A Farm in the Sunlight. In this case, the viewer is denied easy access into the background along a meandering road: the foreground path leads out of the composition to the left, and one is forced to retrace and find other routes to the distant vistas. Karl Döhmann and W. H. Dingeldein, Singraven: de Geschiedenis van een Twentsche Havezate, 4 vols. (Brussels, 1934), 3:144–145. If the two paintings are indeed pendants, one might expect that the Washington composition also represents a precise location. No specific site, however, has yet been suggested for the scene, and it seems unlikely that the buildings here represented, none of which have distinctive characteristics, can ever be identified. Nevertheless, the type of vernacular architecture represented, with the high-peaked roof of the half-timbered barn, is representative of that found in the eastern provinces of the Netherlands, including Overijssel. R. van Smidt, Brussels. Corneille Louis Reijnders [d. 1821], Brussels, possibly by 1788; (William Buchanan, London); purchased 1817 by George Watson Taylor, M.P. [d. 1841], London and later Erlestoke Park, Devizes, Wiltshire; (his sale, Christie's, London, 13-14 June 1823, 2nd day, no. 56, bought in); (Taylor sale, at Erlestoke Park by Robins, 9 July - 1 August 1832, 14th day [July 24], no. 69); (Charles J. Nieuwenhuys, Brussels and London); (his sale, Christie & Manson, London, 10-11 May 1833, no. 128, bought in). (Henri Héris [b. 1790], Brussels); Leopold I, King of Belgium [1790-1865], Palais Royal, Brussels, by 1839; by inheritance to his son, Leopold II, King of Belgium [1835-1909], Brussels; purchased May 1909 with paintings from the royal collection by (F. Kleinberger & Co., Paris and New York); sold 1910 to August de Ridder [1837-1911], Schönberg, near Frankfurt-am-Main; (his estate sale, Galerie Georges Petit, Paris, 2 June 1924, no. 26); (M. Knoedler & Co., New York); sold December 1924 to Andrew W. Mellon, Pittsburgh and Washington, D.C.; deeded 28 December 1934 to The A.W. Mellon Educational and Charitable Trust, Pittsburgh; gift 1937 to NGA. According to the 1823 Taylor sale catalogue. According to the 1833 Nieuwenhuys sale catalogue, which does not include William Buchanan's name, "Reynders" bought the painting in Amsterdam in 1788, and Taylor purchased it in 1817 from him. The Knoedler's prospectus (in NGA curatorial files), prepared at the time of the 1924 sale to Mellon, lists Buchanan as the purchaser from Reijnders in 1817 and the seller to Taylor in an unspecified year. Perhaps Buchanan, a Scottish dealer with agents on the continent, handled the sale from Reijnder to Taylor. Georges Broulhiet, Meindert Hobbema (1638-1709)..., Paris, 1938: 437, and Cornelis Hofstede de Groot, A Catalogue Raisonné of the Works of the Most Eminent Dutch Painters of the Seventeenth Century..., 8 vols., trans. from the German ed., London, 1907-1927: 4:362. In the general election return of 1826, Taylor's address was given as Erlestoke Park, Wiltshire, while in earlier elections he was said to be from London--Saville Row in 1816, Portland Place in 1818 and 1820 (see the letter from C.C. Pond, House of Commons Information Office, London, 12 May 1986, in NGA curatorial files). He died in Edinburgh. Different copies (see NGA curatorial files) of the 1823 sale catalogue document varying results for lot 56: sold for 800 guineas to "Seguire" (results sheet bound into the copy in Christie's Archives); sold for 800 guineas with the buyer unrecorded (paper copy in NGA Library); sold for 840 guineas to "Seguire" (photocopy and Lugt Fiche no. 2636, both in NGA Library); sold with its pendant, lot 55, for 1,750 guineas to Lord Grosvenor (Knoedler fiche of British sales in NGA Library; an additional note is difficult to read); both "bot in" and sold to "Seager" for 840 guineas (photocopy in NGA curatorial file, source not recorded). However, because the painting appeared again nine years later in Taylor's 1832 sale on the premises of his residence, it seems likely that it was indeed bought in. "Seguire" and "Seager" probably refer to William Seguier (1771-1843), the dealer, restorer, and first Keeper of the National Gallery, London. When Taylor was forming his collection, Seguier acted as an advisor. Various sources say that the picture was "sold by his heirs in 1832," but Taylor did not die until 1841 (a date confirmed by the librarian at the House of Commons, and the notice of Taylor's death on 6 June in the Supplement to The Times of 12 June 1841). This error may have arisen because the 1832 sale was described as containing the "magnificent property" of George Watson Taylor, a description that could easily be interpreted as signifying the estate of someone who had died. The painting is recorded as being sold to "Searle" (see George Redford, Art Sales, 2 vols., London, 1888: 2:229; Algernon Graves, Art Sales..., London, 1921: 2:30; and an e-mail of 8 August 2007 from Marijke Booth of Christie's Archive Department, London, in NGA curatorial files). However, as Geneviève Tellier has pointed out (e-mail of 7 August 2007, in NGA curatorial files), Nieuwenhuys writes in 1834 that the painting is still in his possession; see C.J. Nieuwenhuys, A Review of the Lives and Works of Some of the Most Eminent Painters..., London, 1834: 138-139. Henri Héris, "Sur la vie et les ouvrages de Meindert Hobbema," La Renaissance: Chronique des Arts et de la Littérature 54 (1839): 7. Geneviève Tellier thinks it is probable that Leopold I purchased the painting from Héris, who sold other paintings to the royal family at this time (see her letter, 12 November 2007, to Arthur Wheelock, in NGA curatorial files, and her dissertation, Leopold II et le marché de l’art américain: histoire d’une vente singulière, Brussels, 2010). There are two red wax seals on the painting’s stretcher, each depicting two lions and a crown, that are likely seals from the Belgian royal collection. 8] After Ridder’s death his collection went on loan to the Städelsches Kunstinstitut und Städtische Galerie in Frankfurt, and in 1913 was put on exhibition briefly in New York and made available for private sale through F. Kleinberger Galleries. Nancy C. Little, librarian, M. Knoedler & Co., New York, says that the painting (Knoedler no. 15993) was bought by Knoedler from Lair Dubreuil, Paris, in June 1924 and was sold to Mr. Mellon in December of the same year (letter, 12 September 1987, in NGA curatorial files.) An annotated copy of the De Ridder sale catalogue in the NGA library does not, however, mention Dubreuil, and gives the buyer as Knoedler. British Institution for Promoting the Fine Arts in the United Kingdom, London, 1818, no. 84. L'Exposition de Tableaux, Palais de S.A.R. le Duc de Brabant, Brussels, 1855, no. 1 in room B.
Ausstellung der De Ridder Sammlung, Städelsches Kunstinstitut und Städtische Galerie, Frankfurt-am-Main, 1911-1913, no catalogue. The Collection of Pictures of the late Herr A. de Ridder, Formerly in his Villa at Shönberg near Cronberg in the Taunus, F. Kleinberger Galleries, New York, 1913, no. 60, repro. Dutch Masters of the Seventeenth Century, Knoedler Galleries, New York, 1925, no. 17, repro. El Siglo de Oro del Paisaje Holandés [The Golden Age of Dutch Landscape], Fundación Colección Thyssen-Bornemisza, Madrid, 1994-1995, no. 32, repro. The support, a fine-weight, plain-weave fabric, has been lined with part of the tacking margins folded out and incorporated into the picture plane, slightly enlarging the original dimensions. A dark reddish brown ground layer was applied overall, followed by a light brown underpainting in the foreground, which also serves as a mid-tone. The X-radiographs show a preliminary sketch rapidly executed in rough paint strokes with a loaded brush. Pentimenti are visible in the largest tree, whose trunk initially continued down to the figures and whose foliage extended higher. The figures in the foreground may have been repositioned and an additional figure group may have been removed. Paint was applied in thin paste layers, with the foreground, middle ground, and background blocked in with vigorous strokes and individual features added with smaller brushes. The sky was painted first, with reserves left for the trees and landscape. Background elements are worked wet-into-wet, while middle-distance reserves were left for barns and trees. Figures lie over the thinly painted foreground. Scattered small losses and abraded areas exist, along with two extremely large horizontal losses across the lower foreground. Conservation was carried out in 1992 to remove discolored varnish, inpainting, and nineteenth-century overpaint in the foreground. At that time foreground losses were inpainted, re-creating missing landscape details. The NGA Scientific Research department analyzed the pigments using air-path X-ray Fluorescence spectroscopy and found elements consistent with the pigments used in the figures in the area where the tree trunks are now lying and in the area of the fence to the right of the figures (see report dated January 6, 1992 in NGA Conservation department files). British Institution for Promoting the Fine Arts in the United Kingdom. Catalogue of pictures of the Italian, Spanish, Flemish, Dutch, and French schools. Exh. cat. British Institution. London, 1818: 15, no. 84. Buchanan, William. Memoirs of Painting. 2 vols. London, 1824: 2:303. Smith, John. A Catalogue Raisonné of the Works of the Most Eminent Dutch, Flemish and French Painters. 9 vols. London, 1829-1842: 6(1835):128-129, no. 52. Nieuwenhuys, Charles J. A Review of the Lives and Works of Some of the Most Eminent Painters. London, 1834: 138-139. Héris, Henri. "Sur la Vie et les Ouvrages de Meindert Hobbema." La Renaissance: Chronique des Arts et de la Littérature 54 (1839): 5–7. L'Exposition de Tableaux. Exh. cat. Palais de S.A.R. le Duc de Brabant. Brussels, 1855: no. 1 in Room B.
Thoré, Théophile E. J. (William Bürger). Trésors d’Art exposés à Manchester en 1857 et provenant des collections royales, des collections publiques et des collections particulières de la Grande-Bretagne. Paris, 1857: 287. Thoré, Théophile E. J. (William Bürger). "Hobbema." Gazette des Beaux-Arts 4 (October 1859): 35, 38. Scheltema, Pieter. "Meindert Hobbema: Quelques Renseignements sur ses Oeuvres et sa Vie." Gazette des Beaux-Arts 16 (March 1864): 219 n. 3. Michel, Émile. Hobbema et les paysagistes de son temps en Hollande. Les Artistes Célèbres. Paris, 1890: 24, 49. Cundall, Frank. The Landscape and Pastoral Painters of Holland: Ruisdael, Hobbema, Cuijp, Potter. Illustrated biographies of the great artists. London, 1891: 155. Lafenestre, Georges, and Eugéne Richtenberger. La Belgique. Paris, 1895: 132. Roberts, William. Memorials of Christie's: A record of art sales from 1766 to 1896. 2 vols. London, 1897: 1:106. Michel, Émile. Les maïtres du paysage. Paris, 1906: 207. Hofstede de Groot, Cornelis. A Catalogue Raisonné of the Works of the Most Eminent Dutch Painters of the Seventeenth Century. 8 vols. Translated by Edward G. Hawke. London, 1907-1927: 4(1912):362, no. 28. Hofstede de Groot, Cornelis. Beschreibendes und kritisches Verzeichnis der Werke der hervorragendsten holländischen Maler des XVII. Jahrhunderts. 10 vols. Esslingen and Paris, 1907-1928: 4(1911):379, no. 28. Holmes, Charles John. "Pictures Lately in the Collection of the King of the Belgians." The Burlington Magazine 15 (February 1909): 238-243, repro. Roberts, William. "The King of the Belgians’ Collection of Old Masters." The Connoisseur 24 (August 1909): 203-210, repro. Wauters, Alphonse Jules. Les Collections de Tabelaux du Roi des Belges. Brussels, 1909: 5. Bode, Wilhelm von. Die gemäldegalerie des herrn A. de Ridder in seiner villa zu Schönberg bei Cronberg im Taunus. Berlin, 1910: 30. Michel, Émile. Great Masters of Landscape Painting. London, 1910: 164. Bode, Wilhelm von. The collection of pictures of the late Herr A. de Ridder in his villa at Schönberg near Cronberg in the Taunus. Translated by H. Virgin. Berlin, 1913: 14, pl. 60. Graves, Algernon. A Century of Loan Exhibitions, 1813–1912. 5 vols. London, 1913-1915: 2(1913):514, no. 136. Catroux, R. Claude. Catalogue des Tableaux anciens composant la Galerie de M. A. de Ridder. Paris, 1924: unpaginated, no. 26, repro. M. Knoedler & Co. Loan Exhibition of Dutch Masters of the Seventeenth Century. Exh. cat. M. Knoedler & Co., New York, 1925: no. 17, repro. Rosenberg, Jakob. "Hobbema." Jahrbuch der Preussischen Kunstsammlungen 48, no. 3 (1927): 151. Broulhiet, Georges. Meindert Hobbema (1638–1709). Paris, 1938: 52-53, 326, 437, no. 449, repro. Preliminary Catalogue of Paintings and Sculpture. National Gallery of Art, Washington, 1941: 97, no. 60. National Gallery of Art. Book of illustrations. 2nd ed. Washington, 1942: no. 60, repro. 26, 240. National Gallery of Art. Paintings and Sculpture from the Mellon Collection. Washington, 1949 (reprinted 1953 and 1958): 100, repro. National Gallery of Art. Summary Catalogue of European Paintings and Sculpture. Washington, 1965: 67. Stechow, Wolfgang. Dutch Landscape Painting of the Seventeenth Century. Kress Foundation Studies in the History of European Art 1. London, 1966: 78-79. National Gallery of Art. European Paintings and Sculpture, Illustrations. Washington, 1968: 60, repro. National Gallery of Art. European paintings: An Illustrated Summary Catalogue. Washington, 1975: 174, repro. Walker, John. National Gallery of Art, Washington. New York, 1975: 295, no. 396, color repro. Walker, John. National Gallery of Art, Washington. Rev. ed. New York, 1984: 295, no. 389, color repro. National Gallery of Art. European Paintings: An Illustrated Catalogue. Washington, 1985: 201, repro. Sutton, Peter C., and John Loughman. El Siglo de Oro del Paisaje Holandés/The Golden Age of Dutch Landscape Paintings. Exh. cat. Fundación Colección Thyssen-Bornemisza, Madrid, 1994: 132-134, no. 32, repro. Wheelock, Arthur K., Jr. Dutch Paintings of the Seventeenth Century. The Collections of the National Gallery of Art Systematic Catalogue. Washington, 1995: 127-130, color repro. 129. Tellier, Geneviève É. Léopold II et le marché de l'art américain: histoire d'une vente singulière. Nouvelle histoire de Belgique 1909. Bruxelles, 2010: 241-250. Tummers, Anna. The Eye of the Connoisseur: Authenticating Paintings by Rembrandt and His Contemporaries. Amsterdam, 2012: 101, 102, color fig. 47. Wheelock, Arthur K, Jr. "The Evolution of the Dutch Painting Collection." National Gallery of Art Bulletin no. 50 (Spring 2014): 2-19, repro. Émile Michel, Hobbema et les paysagistes de son temps en Hollande (Paris, 1890), 49; Wilhelm von Bode, Die Gemäldegalerie des Herrn A. de Ridder in seiner Villa zu Schönberg bei Cronberg im Taunus (Berlin, 1910; English ed., trans. Harry Virgin, Berlin, 1913), 14. Inv. no. 2404. John Smith, A Catalogue Raisonné of the Works of the Most Eminent Dutch, Flemish and French Painters, 9 vols. (London, 1829–1842), 6:129, no. 53; Cornelis Hofstede de Groot, Beschreibendes und kritisches Verzeichnis der Werke der hervorragendsten holländischen Maler des XVII. Jahrhunderts, 10 vols. (Esslingen and Paris, 1907–1928), 4:401–402, no. 89; Georges Broulhiet, Meindert Hobbema (1638–1709) (Paris, 1938), 441. The dimensions of the Louvre painting (80 x 66 cm) are similar to those of A Farm in the Sunlight. Jakob Rosenberg, “Hobbema,” Jahrbuch der Preussischen Kunstsammlungen 48, no. 3 (1927): 151. Karl Döhmann and W. H. Dingeldein, Singraven: de Geschiedenis van een Twentsche Havezate, 4 vols. (Brussels, 1934), 3:144–145.